Here’s a photo of Matron Helena Hartigan while at No.7 General Hospital, St. Omer, 1915. The picture was taken from this page on Sue Light’s Scarletfinders website. Helena HARTIGAN was born 8 April 1878 in Crean, Co. Limerick, the daughter of James Hartigan, gentleman farmer, and Maria Ryan Hartigan. 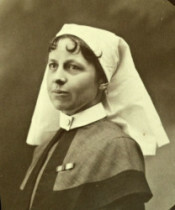 Trained as a nurse at St. Bartholomew’s Hospital, London, between 1901 and 1904 before joining Queen Alexandra’s Imperial Military Nursing Service in May 1905. She must have known Edie at Bart’s as their training dates are very similar. 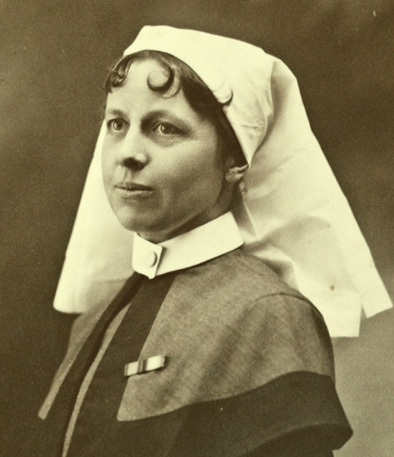 Held the position of Acting Principal Matron in France and Flanders during the Great War, and was awarded the Royal Red Cross, First Class in June 1915, and a Bar to the award in January 1919. Retired from the service in June 1928, and died in 1931, aged 53 years. Her brother was Lt. General James Andrew Hartigan, Royal Army Medical Corps.